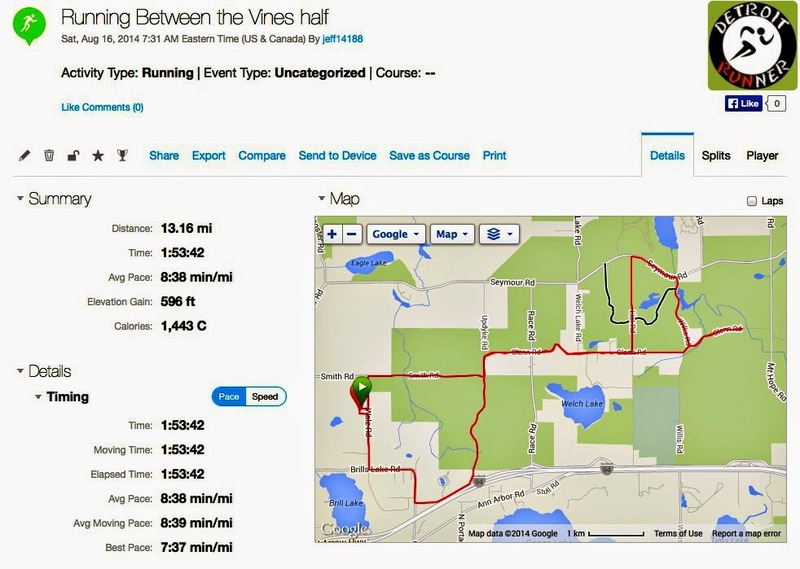 This was a new half marathon put on by Running Fit Events. A well organized race at a great venue. The vineyard was a great place for a race and the hills in the area were challenging. It's a little far, at least for me, to get to this one but I was happy I ran it. Overall it's a good race to put on your list for next year. Registration was very simple as it always is with Running Fit Events. All you do is go to their website and register. I like that Running Fit Events makes a website for each race they organize. All information is clearly laid out on the website and the staff is responsive if needed. I registered for the Thirsty Three series and this was race #2 of the series, the other being Hightail to Ale in May and The Scrumpy Skedaddle in October. A great value if you signed up for all three races at the first offering. The communication prior to the race was excellent with numerous emails with detailed information. 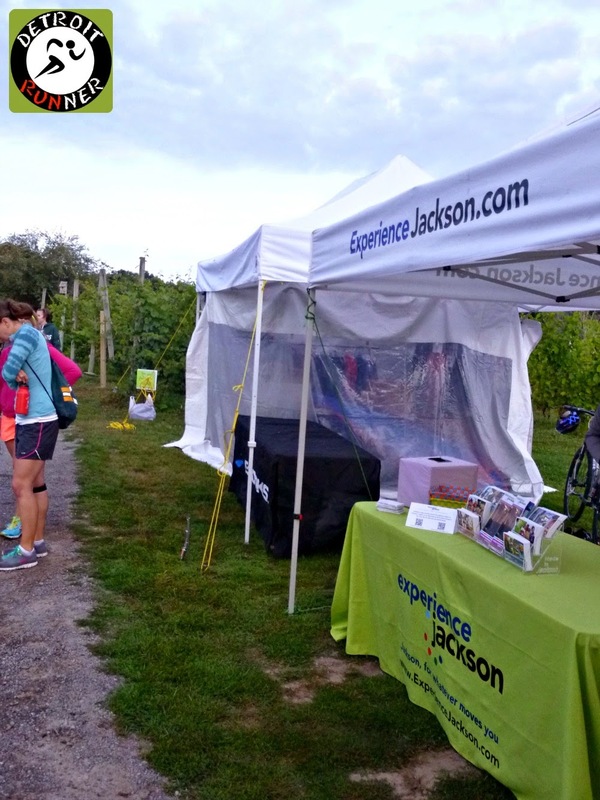 The race offered packet pickup both the day before and race morning as all races should do. Since I'm over 1.5 hours from Jackson, I opted for race morning packet pickup. My day started with a 3:55am wake up. I planned to carpool with Amber who I met thought SEMR(South East Michigan Runners) Facebook page and picked her up at 5am to get over there timely. I'm always an early guy but when we got there, there was already plenty of people pulling in to park. You can see below how many runners were already there and we arrived around 6:15am. We parked in a field that was right next to the vineyard. I'm happy they didn't get the rain we had earlier in the week as this could have been a mess but it worked out well being next to the start area. We made our way over to the registration area. As you can see, it was a glorious day and the temperatures were incredible for August with the race starting in the high 50's! The vineyard looked really nice. As is customary, Running Fit had a list of the runners bib numbers so you could get your packet. In addition, they sent an email so you could look it up before you got there too. Packet pickup was very simple and and we had our packets in a manner of minutes. The volunteers did a great job. From there we took our packets back to the car and waited a little closer to the race start time to come back to the area. With about 40 minutes before race time, we got in line for the bathrooms. The race had plenty of port-o-johns for the runners although there was quite a line for the 5k'ers. The race even had wash stations outside of the bathrooms which you rarely see. Yeah, I know, who takes pictures of Port-o-Johns? Haha! The race also had somewhat of a mini expo prior to the start(as well as after) of vendors selling their merchandise. The folks selling medal holders, Detroit Metal Works, who also are making the Thirsty Three holder, was there selling other medal holders too. We just chilled and chatted with some other runners as we were waiting for the start of the race. It was an early start of 7:30am. While it's a bit early, had it been really hot, it would have been most welcome and was still was not that early. The race also had their maps out of the courses if you wanted to see what you would be running. These were also on their website. We were in for a hilly route. While Running Fit has been hit or miss on the National Anthem, they had a bugle player there doing it and I love starting races with it. It just makes it feel complete. How fitting was it that as the National Anthem was playing, several Sandhill Cranes flew overhead as we were at the Sandhill Crane Vineyard. It could not have been more perfect for the race start. My goal for this was to run this as a training run. I did not do that. I changed it to a sub 2 hour goal as we started but ended up pushing harder than I should have given I have a full marathon in a week. It was a dumb mistake on my part but I enjoyed running the race hard. It was quite hilly and a challenge but a wonderful course. I was really happy we had a lot of the course on dirt roads and they were in good shape. As you can see from my Garmin, it registered almost 600 ft of elevation gain. Yes there were lots of rolling hills but nothing that would kill you. You can see we went up then went down then went up again. That continued throughout the entire course! Apparently I was feeling really good given my negative split of the course. Of course, I was feeling good since I was in taper mode. 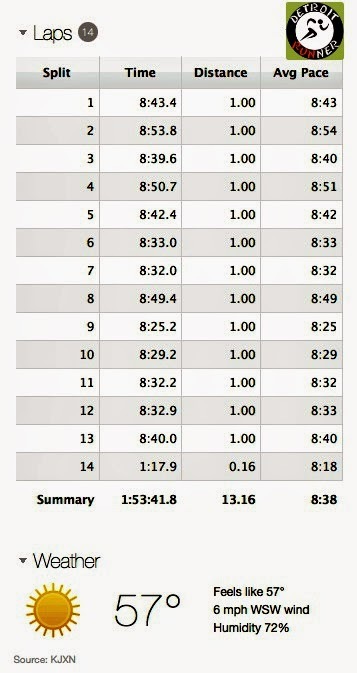 What I should have done was run this slower! Oh well, it's too late now. The first little bit was on asphalt but quickly turned to dirt roads. While it was a nice sunny day, my pictures did not come out as good as I hoped given most of the course was shaded. It's certainly not a bad thing that it was shaded as it made for a really nice run. Onto the dirt - so nice! Below is the only part of the course on the dirt roads that had a little more bumps to them than I would have liked but it was literally for 60 seconds of running and all the rest of the dirt roads were in excellent shape. Country Roads - awesome to run! We passed an awesome barn that I really wanted to show you but I didn't quite get a good picture of it. I do love running on country roads even though all I think about is a loose dog that might chase me. Haha! Fortunately, we didn't have any issues like that at all. It was such an enjoyable course. While it was not a huge crowd for the half marathon, the crowd started to thin out quickly. I always had runners around me the entire race which I love but it was never crowded. The girl in the picture below read my "I run to blog about it" shirt and said don't blog about me. I told her I wouldn't but that she might be in a picture. The area here was quite nice as there was a swamp next to us to enjoy. Also there were no deer flies at all, which is common on country roads, which was a relief. It was something I was concerned about but I didn't see any. We continued along the dirt roads. vYou can see how great of shape these were in with no potholes to deal with. What we were dealing with was hills! I never really felt like we were on a flat surface at all. We were either climbing or going downhill. The race had plenty of course marshals out on the course and they were definitely needed on this course as it could have been easy to get off course without them. I do suggest if you are going to run this next year that you train on hills. I really enjoyed this turn here where you can see the runners in front of you. There was a small out and back portion in the race. I did enjoy this part as you get to see the lead runners but you also get to pass those behind you as well. I always feel more connected with the runners when there is an out and back portion. As you can see below, there were lots of runners coming from behind and I truly enjoy seeing them all. I stopped quickly to get a picture of my work buddy, Dan and his friend who were also running the half marathon. There were several spots where the police were out helping direct traffic as well. While it was an open course, it really felt closed given the early start and back roads we were running. The race did a great job keeping us runners safe. The hills continued even as we met more pavement. I've become a runner that dislikes the roads with all my trail running but this was not a long section. It only felt long due to the long rolling hills we had to overcome. As you can see, the race had cones for us to stay to the left and face traffic. Before we knew it, we were back on the dirt roads again - yea! Of course, it didn't mean the hills were gone as you can see from the drop here as we got back on the dirt. Yea - back to dirt! I know many runners try and make up some time on the downhills but I tend to run a fairly even pace whether I'm going up or down. In this case, people would pass me on the downhill and I would catch up on the uphill. The area had some beautiful fields. We were also close to the Waterloo recreation area and I can see why people love to run in this area. I must get back to run the trails in the area at some point in the future. As it started to get warmer, it was nice to be running tree lined streets. Had it been your typical August weather, the course would have been brutal. We really could not have asked for better weather. At this point in the race, it was starting to get difficult. I saw the McDonald's sign for ice cream. Yum, I could have used that at this point in the race. Haha! We were running next to the freeway, hence, the billboard. Below was the very last hill of the race and it almost killed me! What a great place for a motivational sign on the road! There were also a few spectators at the top of the hill cheering runners and it helped keep me going strong. Just before we turned into the finish, there was a crowd of people cheering runners here and it made for great motivation to finish strong. We turned onto the vineyard property passing more spectators and a cool barn too. There was also a small portion on grass as we headed to the finish. One short turn and the finish was there. I couldn't have been more happy to see it and be done! I loved running the course and it's always fun to run a new race in a new area. I didn't get many good pictures of the aid stations. The race had plenty of them. The volunteers were awesome and cheering on the runners. They were well stocked with water and Gatorade and there was also a station with GU around mile 8. While I carry a water bottle, there was no need to run with anything. As you finished the race, volunteers were stationed to give you a water bottle and your finishers medal. As you continued, they also gave you a banana and a bag of pretzels. They had a staging area of sorts where you could stretch out and get a picture near the vines. You also received your finishers glass too which was a nice custom wine glass. It's the first finishers wine glass I received in a race as all the other races I've done included a pint glass for beer. After the race, Amber and I walked around the tasting area. I'm not a wine drinker so I didn't use the three tasting tickets that I received. Since the vineyard also brews beer, it would have been nice to be able to use your tickets to try their beer. At 10am, I was not in the mood for a full beer they were selling. 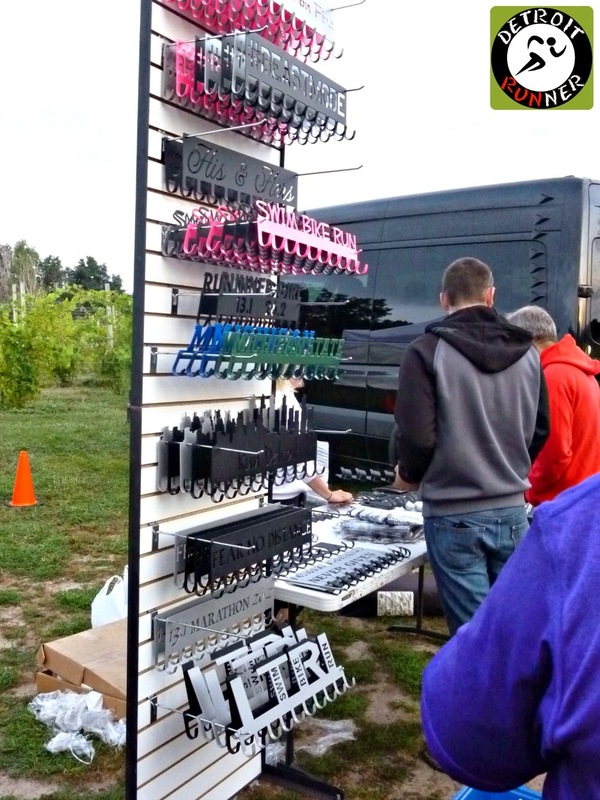 The race did also have numerous other vendors selling their product and offering samples. I tried the cheese, sausage, crackers, hummus and chips, and chocolate and brownies they were giving out as samples. I really enjoyed the finish line area as it was a nice little expo of sorts. The race had a nice band playing some great music and everyone was really enjoying themselves. It was one of the more relaxing finish areas in all the races I had been to. Many races always feel like you rush through the finish area, get food and leave. It was an inviting area to linger and socialize. I talked to Mandy from Running Fit after the race and she asked me what I thought of the race. It's great to see the Running Fit employees out there socializing with the runners getting our feedback. We also checked out all the wine on the inside and there were tons of runners buying bottles of wine. The wine was very reasonably priced if you like wine. While I didn't try it, Amber said it was good. The results were not posted at the finish, at least that we could find, but a volunteer giving out AG awards told us our results. You could also use the QR code on your bib to get your results. For your race entry, you received a chip timed, measured course that was well marked and supported with aid stations. The bib had a QR code so you could check results after the race. You received a customary race button as Running Fit does with all their races. 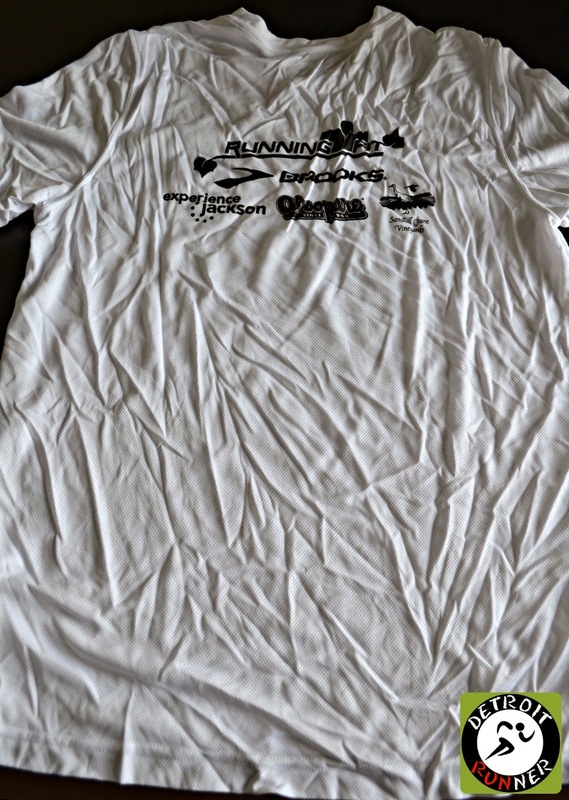 In addition, you received a Brooks Podium tech race shirt that was either a men's or women's cut. I love the Brooks shirts and they should offer these at every race. They wear well and, while I'm not a huge fan of white, this one will get worn regularly in training. The women's cut sure looked small so not sure how they ended up fitting. Considering there were more women running than men, hopefully they fit. 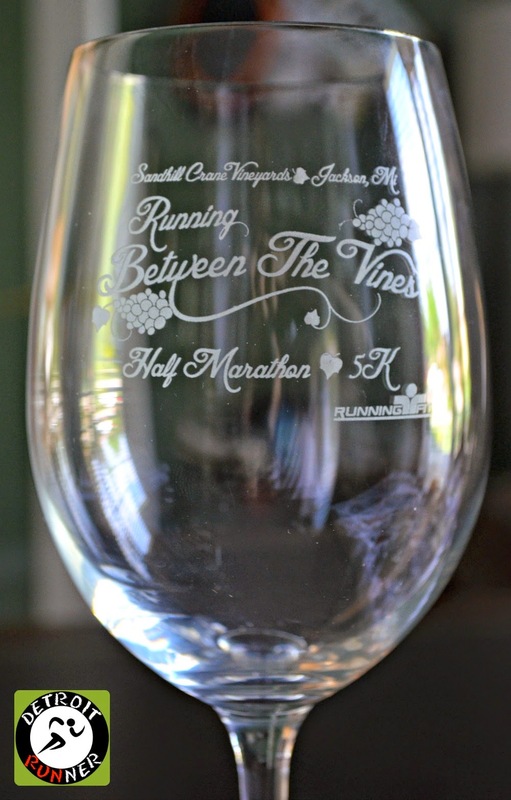 All finishers also received a custom race wine glass. It was very nice and, even though I'm not a wine drinker, this will go into my race glass collection. Finally, finishers received a custom medal shaped like a wine topper. The medal is really nice, a great design and I also love the custom ribbon. As I've said in past reviews of Running Fit events(this is my fifth race by them this year), they have stepped up their race medals dramatically this year and this one is a fantastic design. Well done! The organization for the race was fantastic. The website had all information you needed. The race sent out several emails to runners with additional information. The start and finish areas were well planned. The course was a good design. The race was well supported with police and volunteers. The only thing we could not find was results hanging up at the finish but we did see the 5k results. We were able to get results on our phone and a volunteer helped look up our times. After the race sold out, there were no transfer allowed. I can understand why the race does not want to do that but feel it should be an option for a fee. Overall, it's a race I would run again. Yes, it's a bit far for me to run but worth the drive for a half marathon. I enjoyed the course and the challenge. Running Fit does a great job organizing races. This was a great theme race with the vineyard and wine. I love the Thirsty Three series so far of the two races I've done and it makes me look forward to the last race in the series. Given the last race is a 10k a week before my 50k, I vow to run that race as a training run. Seriously! If you missed the race this year, I think it's one to put on your schedule for next year especially if you like wine. I ran the 5k, because when I signed up for the series in the spring, the idea of running a half in August filled me with dread - little did I know how amazing the weather was going to be! The only parts not on paved roads were on the winery property itself, which was very distracting because the ground was so uneven. I wanted to look up and smile for a finisher photo, but I was afraid of tripping and falling (I did trip later on, trying to walk and drink at the same time, but I swear it was the ground and not the alcohol that was too blame). Overall I thought it was a great race, and definitely a great value. I loved the food samples available afterwards, and since the weather was so great, it was fun hanging out on line for the wine samples and meeting new people while we waited. There weren't any bananas for the 5kers, though, that I saw, which was disappointing, but maybe they were saving them for the half because they thought you guys would have more need. 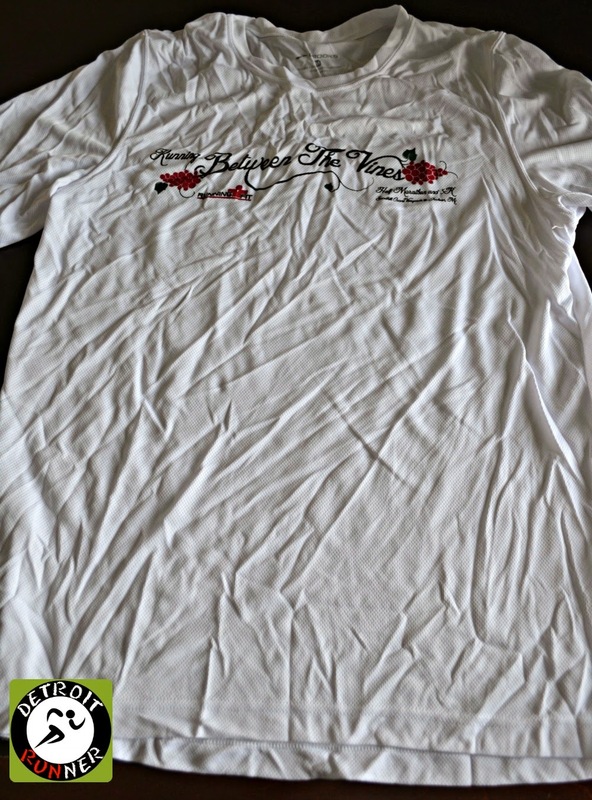 My only other complaint is the shirt - I found the women's shirt to be quite short with a tighter neck, and since it's white, there's probably no chance I'll wear it again (except maybe to another wine-themed race). I think it's really interesting how they varied the details for the three races (season, day of the week, shirt), and I'm looking forward to the Scrumpy Skedaddle in October. Oh, and I didn't get any e-mails about the race (I don't know why), so I appreciated that Running Fit posted the information on Facebook, as well. Running Fit is a great outfit. I have never won an age group award before so it wasn't a big deal they did not post times. I also like to see, though, and checked when I got home. Surprise! 3rd place and left without it. I emailed them and they are sending to the Running Fit store nearest my house. I didn't see many vineyard in your pictures... you should come and run our "Grape Run" some day!!! That medal is really great (or should I say grape?). So it's one week the the marathon... enjoy this week! Nice review. Both 5k and HM times were posted on the outside wall of the winery (near where the band was playing). As usual, nice review that almost made me feel like I was there. It sounds like a challenging one, but it looks like you had nice scenery. I also like that much of the race was on dirt roads. The Milford Labor Day 30K is the only one I've run that was mostly on dirt roads. Good job and make sure you take it easy this week!